Los Angeles – based artist Math Bass (b. 1981, New York) is interested in ambiguous images that produce multiple ways of seeing a single composition. The most famous examples of these kinds of pictures include optical illusions like the duck/rabbit or old woman/young woman. Employing a simplified formal language— solid colors, raw materials, basic geometric shapes, and recognizable symbols— Bass’s works oscillate between bodily and architectural forms, emphasizing the tension between containment and mobility. Off the Clock includes a selection of the artist’s Newz! paintings, recent sculptures, and a new video, Drummer Boi (2015), which was created specifically for the exhibition. 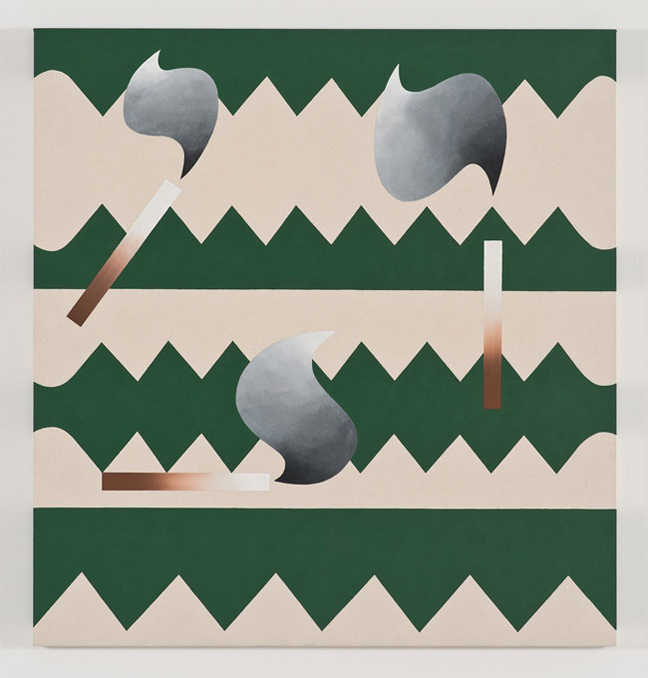 Bass’s paintings deploy a personal lexicon that centers on possible actions or transitional spaces: cigarettes emit plumes of smoke; alligators emerge with mouths wide open; letters and punctuation marks twist and overlap; and archways, staircases, and zigzags suggest movement. 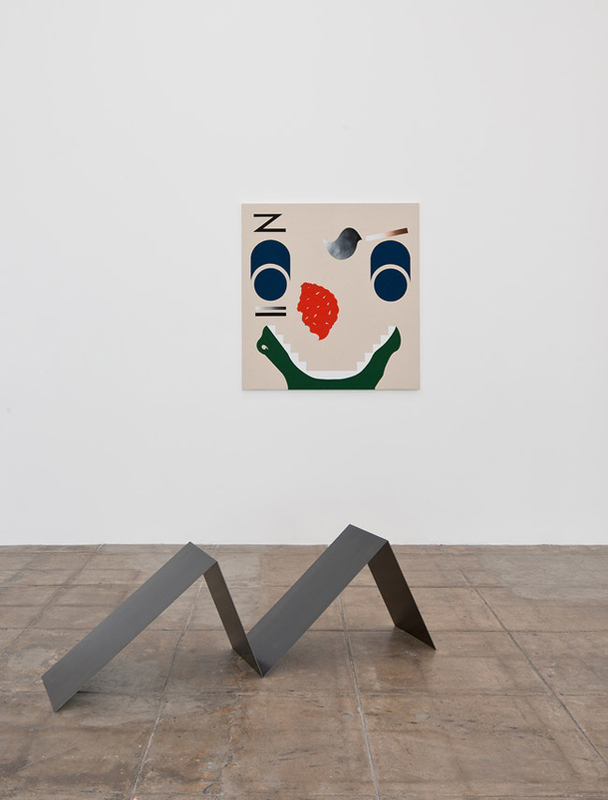 Bass’s sculptures are similarly dynamic— bending, leaning, and slithering across the floor and wall— implying potential actions or movements and corresponding bodily positions. Additionally, Bass invited artist Lauren Davis Fisher (b. 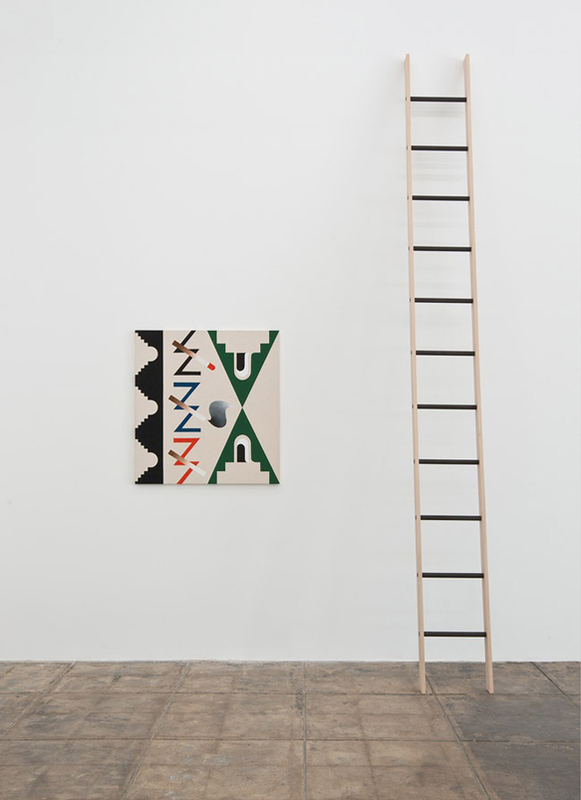 1984, Cambridge, Massachusetts) to present a two-part work that excises from two gallery walls a space equal to the exact proportions of an alcove beneath a staircase in Bass’s Los Angeles studio. Certain forms recur throughout Bass’s work, changing colors and shifting their orientations to complicate and prolong the viewer’s engagement with them over time. Off the Clock animates the transition from work or labor to a space of leisure or play. If the clock represents rigidity, linearity, or someone else’s authority, then “off the clock” implies a more personal, open-ended realm that cannot be pinned down. Often evoking bodies, but refusing easy identification, Bass’s work insists upon many readings with elusive conclusions. 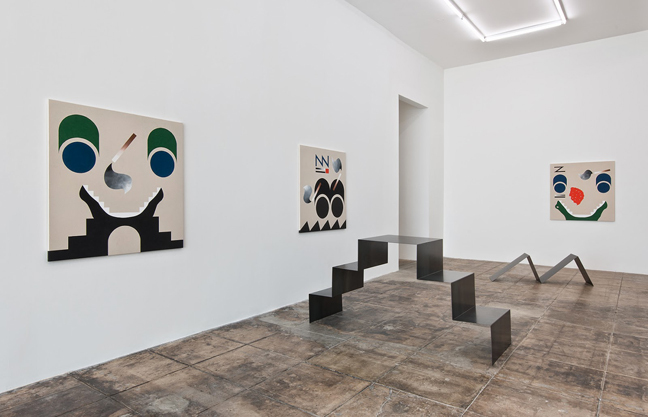 Bass‘s work has been exhibited at Overduin & Co., Los Angeles; Michael Jon, Miami; Chapter NY, New York; Wallspace, New York; Night Gallery, Los Angeles; Laurel Gitlen, New York; and Silberkuppe, Berlin; among others. Bass was also featured in the 2012 Hammer Museum Biennial, Made in L.A.